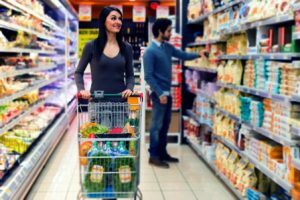 Aldi Accident Claims Guide – How Much Compensation Can I Claim? Aldi has become one of the most popular supermarkets in the UK. In fact, the discount supermarket chain has more than 10,000 stores across 18 different countries. While the company strives to uphold high standards, there are occasions whereby accidents happen. The last thing we want is to end up in hospital after doing our weekly grocery shop. However, if you have been injured while inside an Aldi store or while using an Aldi car park, you may be entitled to a payout. We have helped many Aldi customers and employees to get the compensation they deserve, from those who have tripped in the car park to those that have slipped on water in Aldi. If you are wondering whether you have the basis to launch or claim, or you want to know how to go about it, take a look at our Aldi accident claims guide below for all of the details you could possibly require. What do you mean by an Aldi accident? I have been injured while at Aldi, what do I do now? Am I entitled to a payout if I have been injured while shopping at Aldi? I work at Aldi; can I make a claim for an accident I have been involved in? I was using the car park at Aldi when I was involved in a car accident, am I able to get compensation for this? What damages will I get if I do proceed and make a claim? What compensation will I get for the injury I have sustained at Aldi? What is a 100% No Win No Fee Aldi claim? whether you are able to make a claim for compensation. You will also find plenty of other information on claims against Aldi. This includes everything from securing slipped in Aldi compensation, to what is the accident at work claim time limit, as well as some examples of shopping accidents and accidents at work compensation examples. If you still have any queries by the end of the guide, you will find our contact information; so simply give us a call. So, what is an Aldi accident? This is basically any type of accident that has happened while in Aldi. This could be an accident that occurred inside the store or in the car park. It also could be an accident that happened while you were working there or while you were shopping there. Keep a record of the expenses you have been subject to because of your accident. You will also need proof too. Get your medical report from your doctor. If your injuries are visible, take photographs of them. If there is any proof of an accident at the scene, take some photos. Get in touch with Aldi about the incident so it can be recorded in the Aldi accident book. Write down everything you can remember about the incident. This is the easiest step of them all. Just give us a call! We will happily take care of everything for you so that you do not need to do anything at all. Our advisors have years of experience, so you can have full peace of mind when you use our service. If you need a medical arranged somewhere local, we will also do this without any charge to you. Was the accident your fault? Or, did someone else cause the incident to take place? If the latter applies, you will be entitled to a payout. What about if you were partly to blame? You could receive compensation, but it will be a much lesser amount. It is still worth getting in touch, though, and we can explore this further for you. While Aldi may not appear a dangerous place to work, all workplaces can be dangerous if they are not maintained and managed effectively. No matter whether you want to make a claim due to incorrect training or you wish to launch a back injury at work claim, we can assist. With these sorts of Aldi claims, you simply need to be able to prove that your employer is at fault. Your employer is going to be to blame if he or she has failed to adhere to the health and safety legislation that is in place in the UK, including the regulations that apply to the supermarket and retail industry. If this sounds familiar, we want to help you get the money you deserve. Do you fear that you may lose your job if you proceed with this? There is nothing to fret about, we assure you. There are laws in place to protect you, and so your employer would only end up in greater legal trouble if you were to experience unfair treatment because of the claim you are making. Have you been the victim of a slip in Aldi? Maybe you had a fall in Aldi due to an uneven surface in the car park? Or, maybe you tripped because of a misplaced item in the store? We have years of experience in helping the victims of slip trip fall claims. In fact, these cases are probably the most common. When it comes to Aldi accident compensation claims, it is important to recognise that these claims are applicable for any incidents that happen on Aldi premises, and so this does include the car park. After all, Aldi owns the car park. Therefore, if you have been injured due to an uneven surface, roadworks that aren’t signposted properly, or a pothole, you have grounds for a claim. However, if another car crashed into you, you will need to launch your claim against the driver. We can assist irrespective of the circumstances. So, what exactly are you going to get compensation for? Firstly, you will receive money to compensate you for the injuries you have got and the incident you have been involved in. Known as ‘general damages,’ the medical report that your doctor has put together will mainly be used to determine this amount. Aside from this, you will also receive a payout to cover all of the expenses you have had to fund because of your injuries. After all, why should you be out of pocket because of an accident that was not your fault? The first thing you need to do is speak to your boss and ask if you are injured at work do I get paid? You will then know if you are going to be out of pocket because of the accident. If so, you can claim for loss of income, as well as loss of anticipated earnings in the future. On top of this, you will also receive special damages for any other costs entailed. Examples include travel expenses, counselling costs, medical expenses, and the cost of childcare. If someone has cared for you while you recover, even if they are a friend or family member, they can also launch a care claim to cover the cost of this too. A faulty door, lift, or escalator, which has caused an injury to someone. A misplaced product that has caused an injury through obstructing a person’s path. A spillage or wet floor that has caused a trip, fall, or slip. A faulty product that has caused an accident. A member of staff being negligent, which has caused an injury. An uneven surface or pothole in the car park that has caused someone to fall. A falling object that has resulted in an injury. A cut that has happened because of damaged or defective shelves or fixtures. Income you have missed out on £5,000 - £500,000 Missing work is not uncommon when you have been injured. If you are self-employed or you do not get full sick pay, you can claim for this. Please note that the figure on the left hand side has been exceeded in some cases, so it is possible to receive a higher amount. Income you are expected to miss out on £10,000 -£400,000 If you are still recovering, and your doctor predicts you will need to miss a considerable amount of work in the future, you will receive damages for this. How much you earn at present will be considered, as well as how much you would be likely to earn over the years. Please note that the figure on the left hand side has been exceeded in some cases, so it is possible to receive a higher amount. A traumatic injury £32,700 - £47,050 This is for traumatic injuries that are severe in nature. £12,750 - £21,100 This is for traumatic injuries that are serious in nature. £5,000 - £9,575 This is for traumatic injuries that are moderate in nature. A neck injury £34,575 - £112,750 This is for neck injuries that are severe in nature. £34,575 - £112,750 This is for neck injuries that are moderate in nature. Up to £6,000 This is for neck injuries that are minor in nature. A shoulder injury £14,600 - £36,500 This is for shoulder injuries that are severe in nature. £9,700 - £14,600 This is for shoulder injuries that are serious in nature. £6,000 - £9,700 This is for shoulder injuries that are moderate in nature. Up to £6,000 This is for shoulder injuries that are minor in nature. £1,050 - £1,860 A complete recovery within three months is expected. £525 - £1,050 A complete recovery within 28 days is expected. £525 - £1,050 A complete recovery within seven days is expected. You will find our Aldi accident claims number at the end of this guide if you have any questions regarding the average payout amounts, or if you cannot find the injury you have sustained in the table above. You have probably already searched Aldi injury claims online. It’s likely how you landed on this page. There were bound to be plenty of results, but how many were genuine, 100 per cent No Win No Fee? We say genuine for a reason. A lot of companies may claim to be No Win No Fee, but they still enforce a charge if the claim is unsuccessful. We will never do this. You will not have to pay a penny if we are not successful in securing a payout for you. You may be wondering what No Win No Fee is? This is when a solicitor agrees that they will only charge you if they win compensation for you. There are so many advantages associated with this approach! The most obvious advantage is the financial security: you will have your compensation to cover the cost. Other benefits include the fact that a No Win No Fee legal professional never time wastes. They only take on cases that they believe a genuine chance of being a success. Not only this, but as the lawyer is accountable and impacted by the level of service they provide, you know they are always going to be working hard for you. You can contact us if you need more details on accident at work No Win No Fee cases. Accident Claims is the only company you should consider when making a claim for an accident that happened at Aldi. Why? Well, there are many reasons. Firstly, we have an abundant amount of experience in the sector. You can be sure you will be matched with a solicitor that has up to 30 years of experience in the locker. We have also worked on many cases of this nature, and our success rate is impeccable. One thing we always do is aim to secure the top payout amount that is available. We will also ensure that, every step of the way, you are fully informed. Our friendly team will make you feel completely at ease, and we never use complex legal jargon to confuse you either, unlike other legal firms. And, most importantly of all, we genuinely care about all of the personal injury victims we speak to. We know you are going through a horrible experience, and we want you to focus on your recovery. We don’t want to make your situation worse – only better! So, you concentrate on looking after yourself, and we will concentrate on getting you the payout you are eligible for. Hopefully, you now have all of the details you need about making a claim for an accident that has happened at Aldi. However, if you still have any concerns or queries, we are here to help. We have an Aldi accident helpline number, which is open 24 hours a day, enabling you to get in touch whenever is convenient for you. The number of this helpline is 0800 073 8801. You will speak to a professional advisor with a lot of experience. They will provide you with free advice and you won’t be under any obligation to launch a case once this advice has been given. If you need more time to think about, that is completely fine. We will never hassle you! If you would like some examples of Aldi case studies, including accident at work compensation case studies, we will also happily supply you with this. Feel free to head to our website for a call back instead, and we will ring you at the earliest opportunity. The NHS offers a useful page that covers all treatments and conditions you could possibly think of. No matter whether you have had a locked neck or you have pain in your back, this page will give you advice. This takes you to the UK Government’s HSE website. It provides information on the risks associated with smooth supermarket floors, as well as advice on mitigating these risks. This link provides plenty of advice regarding retail health and safety, from slips and trips to manual handling.